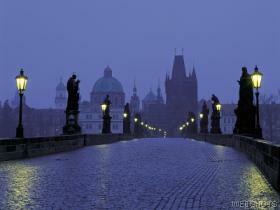 THE PIC IS OF PRAGUE, OUR NEXT DESTINATION...WE LEAVE IN THE MORNING. Ok...so today we went on a day excursion outside of the city about 30 minutes on the train to Oaneinburg, where we took a 15 minute walk to a concentration camp where 100,000 people were murdered. It was one of the most thought=provoking, and body=numbing experience....if that makes any sense. its hard to put into words what we saw, the stories we heard on the 'audio tour', and just the overall feeling of the whole place. a lot of the old buildings were destroyed, because the camp was in the center of this old town...one of the only camps with a close or surrounding town area...so i guess that wanted to destroy as much as possible. Anyways, we saw old prison barracks, sleeping quarters, wash areas(hundreds were forced into this area with only a few minues to wash, eat a small piece of bread, and use the facilities.) the testimonies i heard were just awful....again, no words to describe them. This whole area is full of history, both positive and negative...but we need to remember that all of it is necessary to move forward in our world, to make the people of our world our family, and mother nature our sanctuary. So, after that we came back to the hostel, I looked at the rest of my trip schedule and fixed a few holes where train schedules overlapped, etc, while Meghan and Pat shopped nearby. Then we met up for dinner at an authentic German place. I had a big (GOOD) beer, some roast pork in a brown beer sauce, with potato dumplings, and saur kraut. i ate it all! i splurged tonight on that meal (10 euro for food, and 3.25 euro for the beer = but it was a .5 liter! )...every week or so I hope to be able to treat myself to something like this...but we will see where i am at towards the end of the trip! allright, i have to go to bed soon....patrick and meghan are out having a beer somewhere..not my scene anymore really...i like an afternoon beer, but late at night i adore my sleep! am i getting old? by the way it's really smokey and loud here...actually everywhere in europe people smoke...it is rare to find a non=smoking area in a restaurant even...mom, you would hate it! i find it hard...but it guess that is the european way. i just try to avoid it as much as possible! i love my lungs and hearing! I got to talk to brandon last night = that made my day!!!!!!!!!!!!!! Thanks babe! I love you so much!!!! i will see you soon!!!!!!!!!! love you. love to my family and friends too!